If you are not paying attention to your business packaging, you may be missing a valuable opportunity to carry your brand outside your doors. A well-crafted retail packaging solution not only creates customer satisfaction with existing customers, but it also can be used to introduce your brand to people who might never visit your website or walk through your door, otherwise. When it comes to packaging, if brand promotion is at the forefront of your mission, then you want to make sure you revamp your packaging often and use it to place your products in the public arena in a way that is eye-catching, informative, and that also appeals to your core demographic. Shape – You can pique interest with an interesting shape and it can also help you to package unusual items in your store. Not everything should go in a bag, sometimes boxes and other oddly shaped packaging will work better for items in your store. Have them in a variety of sizes so that no matter whether your customer is buying a set of makeup brushes or collection of perfume, you will still have the perfect “bag” to go with it. Colour – Black is a colour and so is white. If you’ve been intent on only gathering attention with bright, multi-coloured packaging, it may come as a surprise that changing to a monochromatic or two-toned scheme can do a lot to enhance your brand. Keeping the same colour or brand in packaging can sometimes enhance branding, like in the case of the blue velvet Tiffany box, but more often than not a change in packaging presentation can re-invigorate your brand. Style – What demographic are you trying to reach? Young hipsters or their more conventional elders? Your packaging should reflect the style most appealing to your ideal sales demographic. It can also take into account new trends in mass consumer culture to update a style that has become “old-fashioned” and dated. Message – You can tell a story with your packaging as well. It doesn’t have to be all about the visuals. Use text to say something about your business. Describe your mission with your logo. Even go as far as adding your website URL to make sure that while your customer is out and about town others might still see where they can find you online. Surprise factor – This isn’t just about the style, it can also be about the inserts inside the bag. Add a little surprise “thank you” or include some pretty tissue to make it appear like a gift bag. Opt for the unexpected and your customer will be surprised, in a good way. Ease of use and reuse – If part of your mission includes being environmentally-friendly, you can also make use of packaging to transmit some of those core brand values. You can opt for reusable materials to fashion the packaging or make the bag itself reusable in everyday life. However, you want it to be self-explanatory on how to reuse the bag, so that people understand that it’s also an easy, no-hassle, concept. White Stuff – If you happen to have a brand name that can also clue you into the colour scheme, like White Stuff, you are in luck. 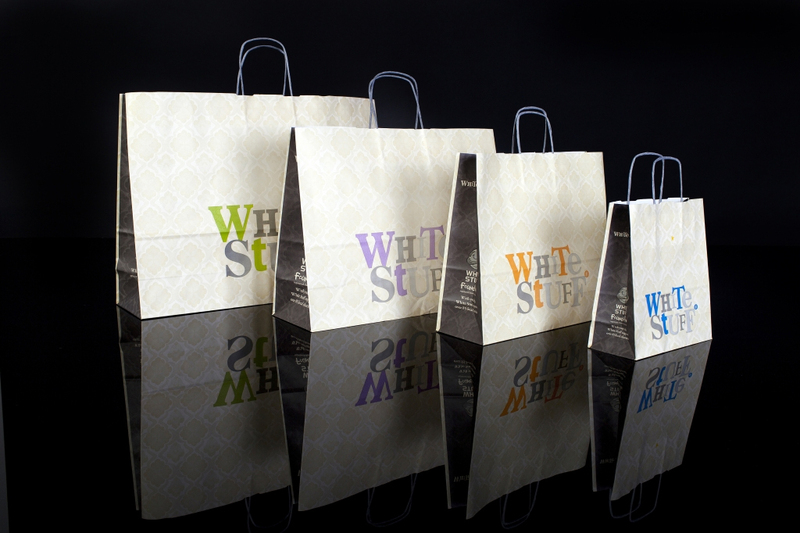 Fashion retailer, White Stuff, may have gotten the name from the two founders who enjoyed the “white stuff” when skiing. However, it also presented a unique opportunity to create packaging with a white background and simple text that is immediately evocative of the name brand itself. 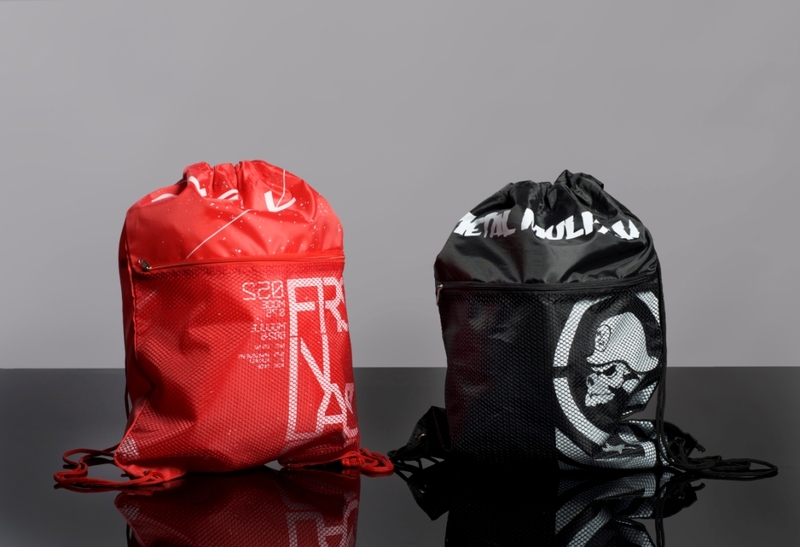 O’Neill – Surf wear maker, O’Neill, decided to enhance their brand by creating a polyester duffle bag packaging that can be re-used while out on the beach. It has the name brand boldly printed on it and will remind surf goers of the enjoyable shopping experience, even when they are out catching the waves. Sephora – The Sephora line of cosmetics is the perfect brand for whimsical shapes and design elements that appeal to a younger demographic. You can see small pop-tart like shapes as well as large bags with big red lips stamped on them. 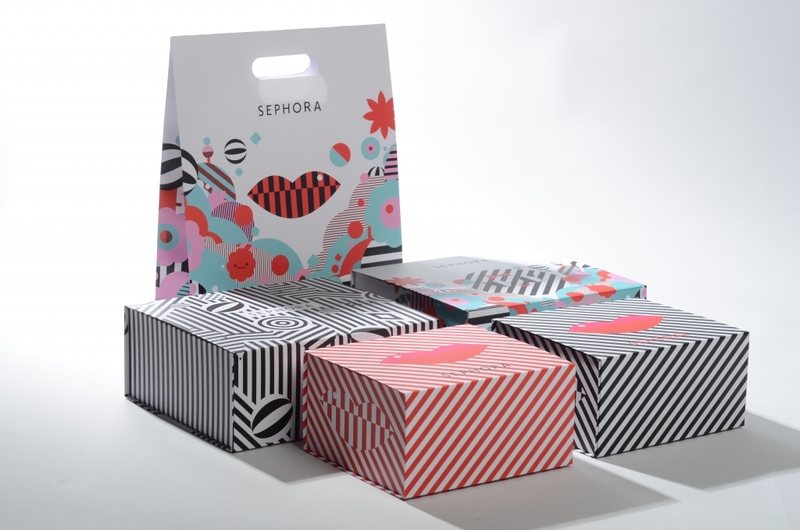 Sephora is so determined to use their packaging in their branding campaign that they’ve even created special holiday packaging with magnetic closures and die-cut designs featuring bright, pop culture art and bright red tissue inserts to please their patrons. Their hope is that the buyer will use the packaging as gift boxes, without repackaging, so that their brand is also associated with special occasions. By researching the approach other businesses have taken when choosing their packaging, you can get a good idea of the many options available to help you enhance your brand with different packaging options. With the forthcoming bag charges – in Scotland and England, Could the removal of your carrier bag also mean the removal of your brand presence in the High Street. Is now the time to turn to re-usable bags and gain the same impact? If you would like to see samples or talk to us about your retail packaging, please give us a call on 0116 289 0900 or email info@keenpac.co.uk.